Does a Sailing Yacht need a Quarter Berth? Refurbishing my sailing yacht enables me to have intimate insights. A load of practical experiences in construction, structural and basic solutions and all the stuff normally hidden behind nicely varnished veneers and panels. Doing it by myself also makes me understand how things have been done here by the yard and how I can have them repaired: That´s truly unique. Someone who is buying a brand new boat won´t have the opportunity make. In the course of the whole refit project I do have the aim to preserve the character of my King´s Cruiser 33 GRP classic cruiser trying not to change too much of the ship. Back to those days when SY OLIVIA was still sailing: When will I ever be able to relax like this? But when it comes to the quarter berth I am not so sure about this credo anymore. 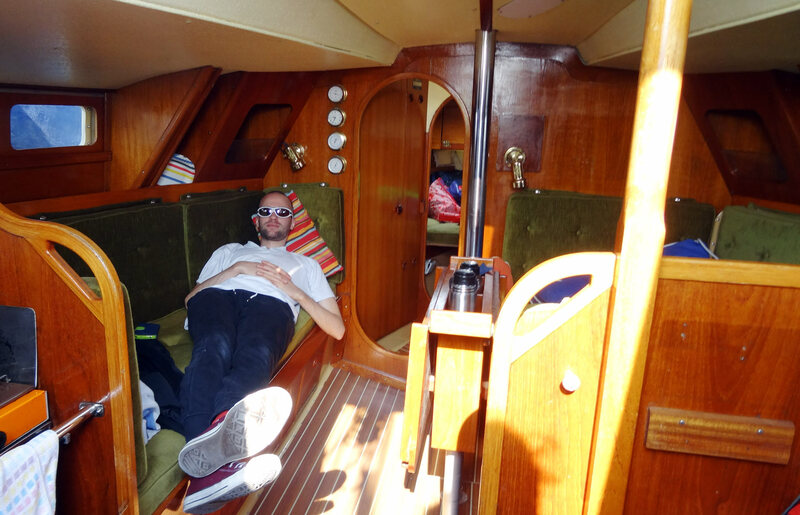 This article is about some thoughts on how I could make a different use of the quarter berth – other than maybe just having a sleeping place. My King´s Cruiser 33 offers accommodation for six people. Two in the fore cabin, three in the saloon on the large settees and one another in the aft quarter berth. Being a 40 year old boat of the IOR-era the hull couldn´t be outfitted with an aft cabin. 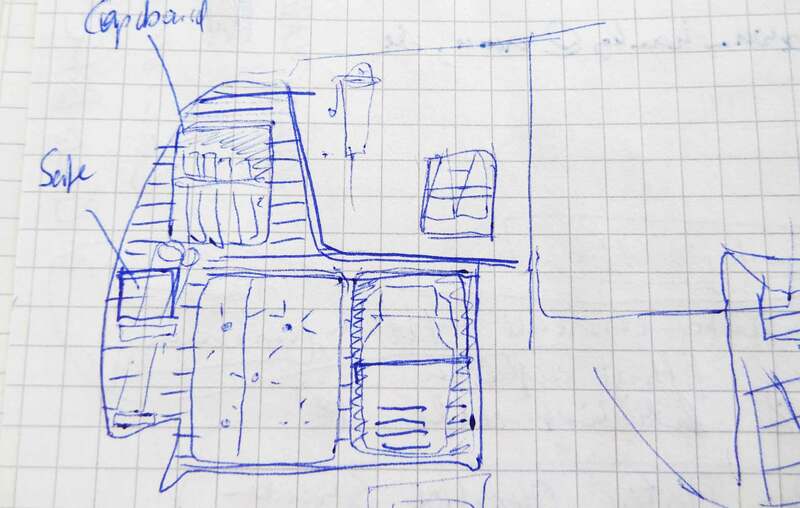 Instead there´s a cave-like berth of more 2 meters in length: It´s where the skipper was supposed to have his berth. Deep down there are some 50 centimeters width left, at the entrance we´ve got 1.10 meters. That´s plenty of space and fairly enough for an adult to find a good night´s sleep. 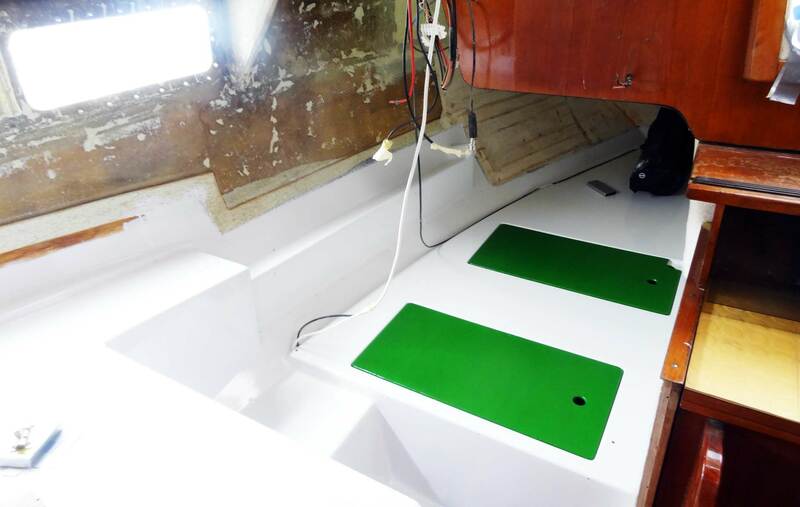 The quarter berth also houses one hatch acting as service entry for the fresh-water tank and another hatch which opens up to a large stowage. The quarter berth as well serves as seating for the navigator´s place at the chart table facing forward – one of the most important spots onboard. The quarter berth is partially covered with mahogany battens, one large cushion will provide for the mattress. Quite simple, isn´t it? So, naturally, this shouldn´t be of too much interest or causing problems during a refit. Really? Do I really need a Quarter Berth? This is indeed a question that´s been raising all the time when I am thinking through the refit program. Asking friends with smaller GRP-classic boats on their customary use of the quarter berth, most of them would answer like this: “I don´t really sleep there. Nobody would sleep there. We would most of the time have this space utilized for storing sails and provisions.” And this is exactly what I have been told by the pre-owner of my SY OLIVIA upon having inspected the ship: He simply never used the berth for sleeping. Instead, it was utilized for stowing stuff. Reading books and websites about classic GRP sailing yachts like my King´s Cruiser 33, it´s common sense that quarter berths are – though theoretically quite practical for the skipper to find some rest between tiring watches – rarely used in reality. It is said that these kind of berths are among the wettest spots of a yacht in heavy weather. On the other hand because of being kind of poky it´s also one of the safest berths when ship is rolling: You simply cannot fall off the berth. But again, most of the articles I read have been praising the quarter berth for offering large stowage capacity, especially when it comes to additional sails. As it is the case with my cruiser: There´s simply no spot on board the whole ship to have the jib, storm jib or Genoa stowed when underway. So basically the common view on quarter berths is like “you don´t really need it”. Talking about my very own ship, there are some more problems making me think of maybe utilizing the space of quarter berth differently: Rather providing a sleeping place I will never utilize (since this yacht will be sailing with wife and children, but not with six people cramped in 33 feet) I could transform this area into a more useful spot. 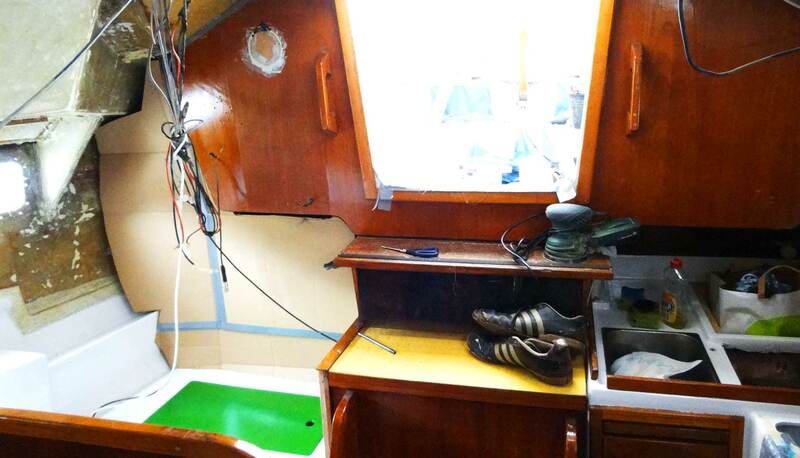 Problem 1: The galley of my King´s Cruiser 33 offers a large fridge. But this freezing unit is old, very old. It consumes more energy than I could possibly approve and besides, it´s way too big. I have no need for such a huge freezing stowage since we won´t have to have 8 ice-cold bottles of Champaign on board. So I need a place to install a new fridge-like cooling unit. But I cannot transform the old fridge into a new one, I have to go somewhere else to install the new appliance. Problem 2: I indeed want to stow spare sails and other parts onboard but I don´t want to have them in sight all the time. I want my ship to appear clean and cluttered. Seeing a laden quarter berth leaves a mark of a kind of a farrango. I don´t like that. So it would be best to have a kind of large stowage not bothering the cluttered appearance of the ship´s interior. Problem 3: Having assessed the overall condition of my boat after purchase I noticed the somewhat cramped situation at the chart table. After some 40 years every one of the 4 pre-owners did add something to the table, mounted a little thing here and there to the bulkhead, a screw, a hook, a Navtex and all that stuff. Thus creating a kind of chaotic and improvised appearance. I have to change that – so I need space for all the little things like First Aid package, EPIRB, cupboard for books and stowage for charts, board cash and so on. Problem 4: I love the clean lines of the King´s Cruiser above water line. This design drawn by famous Swedish Designer Pelle Petterson who is still designing sailing yachts for Polish Maxi Group, makes her appear more modern than she is. As I bought her I noticed that the only possible space to have the life raft stored on deck is right behind the mast. 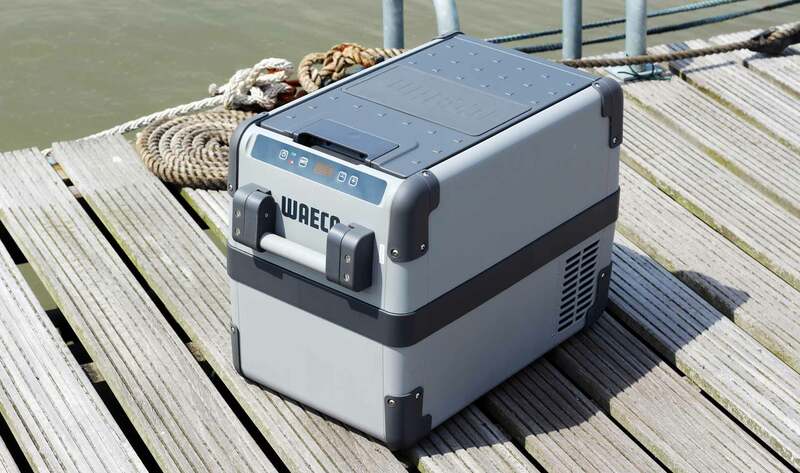 But this huge hard case would totally obliterate the design of the boat. Having it mounted to the stern is worthless because of the large overhang of the IOR-era stern design. I want to have the life raft stored down in the cabin. I am sure in case of emergency bringing the raft up deck, connect it to the boat and bring to water would need the same effort as it would need if I would to go on the fore deck to have the raft hoisted over the reeling. But I need again stowage under deck where I could “hide” the raft from permanent view. So I am asking myself, do I really need to have a quarter berth for sleeping or do I rather want to take the opportunity now to have this space converted into stowage? An intelligent solution for all the little problems and hurdles I am facing right now with the whole concept of refitting the ship? Let´s play around with the ideas I currently have in mind right now. Well, first of all: I am creating more work here than I would have when refitting to the original condition. This is why I have to think through everything thoroughly. Refurbishing the quarter berth to have the original King´s Cruiser 33 appearance of the year 1975 wouldn´t cause too much trouble here: I simply would have to redo the mahogany-battens covering partially the hull and build a new cupboard running down at the side of the quarter berth the whole length of it. The rest would be painting the leather covered GRP-hull plain white. The cushion will be re-done for the whole ship as one of the very last items on my todo-list and that´s basically it. Maybe adding a reading light would further improve value of this berth. Anyway, as noted above: I am not going to sleep here (since I like most the portside berth in the saloon on the settee most) and in the end, the quarter berth will be going to be cramped with spare sails. So, what´s the alternative? So, when it comes to the alternative, the basic idea is to separate the space of the ex-quarter berth from the ship´s interior by a new bulkhead. This bulkhead would seal off stowage and make use of a newly created space for all the stuff mentioned. 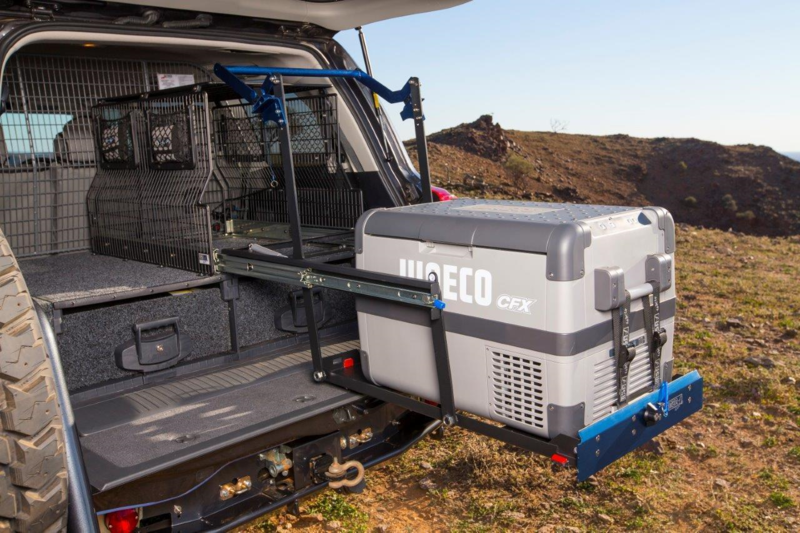 There´s suddenly room for the fridge, for the life raft, for sails and other spare parts. Another point is that this new bulkhead creates a space to be utilized to have all the small stuff and parts mounted to which would otherwise have to be installed all around the chart table. Behind the bulkhead I can hide the 3 big things, sails, fridge and life raft. Of course, that´s a major change in the King´s Cruiser design and would transform the boat into something different from the original. On the other hand, this solution could really improve the situation on board enabling me to have my stowage problems resolved. In order to further investigate if this encroachment is both a practical and possible way of refurbishing the ship, I decide to first build a mockup to review my plans. 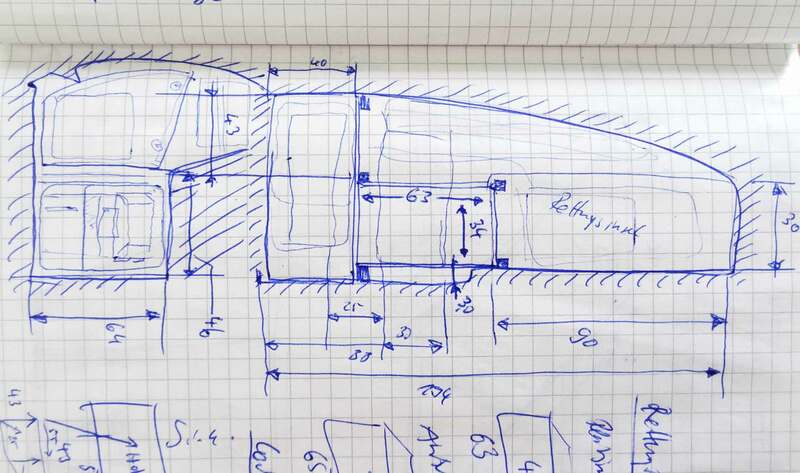 Using stronger packaging paper I try to facilitate a first model of the bulkhead which proves to be a tricky task: The area is far from being quadratic. I´ll have curved lines, sharp and blunt edges and this a lot of them. 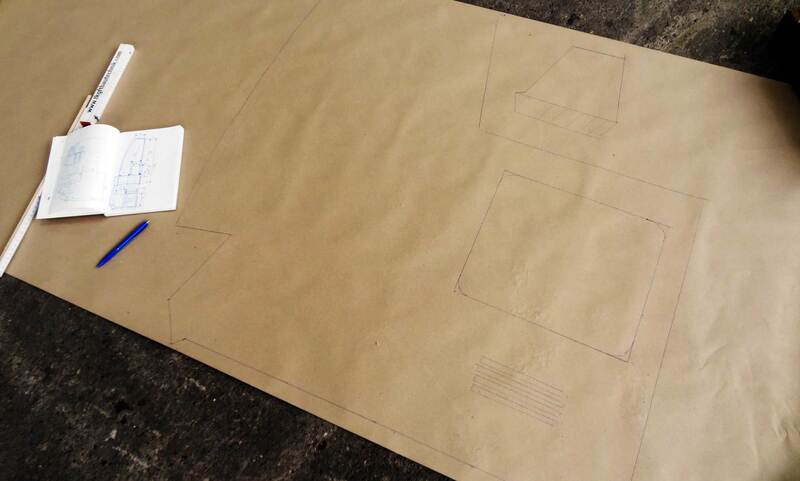 It´s a very complicated pattern and after trying around more than one hour I am finishing the third brown-paper-model of the bulkhead that kind of fits. Next step is cardboard. Again, taking measurements of the large seams left by the rather inaccurate first model I can transfer the lines onto strong cardboard. After cutting out the bulkhead mockup I am again trying to fit in the model: Again having to apply changes to the construction to have it fitted properly. Upon finishing this model I am now enabled to gain a first impression of how it would look like to have the quarter berth sealed off and hidden by one´s eyes by means of a new bulkhead. Oh. That´s a completely different appearance of the saloon! After having done so, I am transferring the measurements of the new freezing unit (a brand new Dometic compressor fridge) to the area to have an access to the appliance. The fridge is placed right next to the entryway and taking stuff out or putting things in is easily done. Besides, the old fridge adds to stowage for supplies I would have otherwise had to stow away in other parts of the ship: Now right here in the galley. Behind the fridge I am going to have the life raft stowed. It´s both a convenient spot, away from one´s sight and on the other hand I could reach the raft quickly in case of distress: Through a large-enough servicing hatch in the bulkhead. This hatch is hidden by cushion forming the backrest of the navigator´s place at the chart table. Now I can sit here and do the logbook and can have by back put against the bulkhead – something impossible with the original configuration of the quarter berth. Again, through this servicing hatch I can now put in and take out spare sails in an easy way and stow away more of the bigger spare parts or the manual bilge pump and other stuff. Additionally, above the backrest I am going to add a cupboard for having a small amount of books stored and a shelf for nautical charts is planned as well. The EPIRB distress buoy will have its place here alongside maybe the First Aid-package. In the end, I am able to have a lot of stuff mounted here at or behind the new bulkhead. 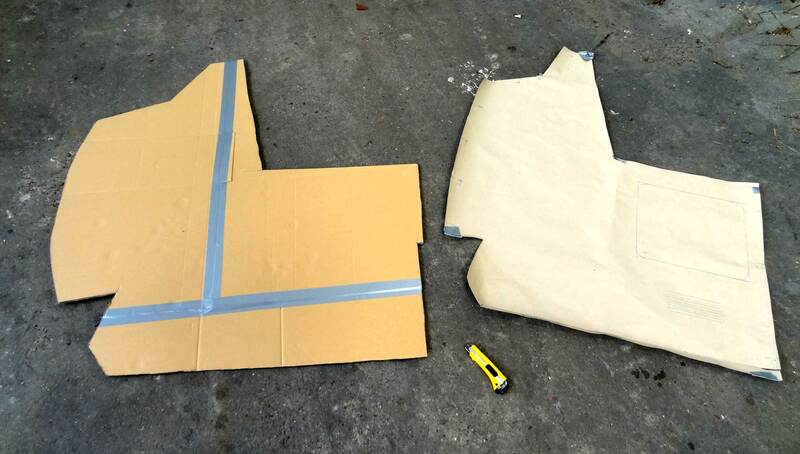 Now that I have the 1:1 mockup it´s an easy thing to fabricate it and have it installed. But: Do I really want to do this? Oh my, that´s really a tough decision. Why? Because it changes the appearance of the ship´s interior completely. Visually, it will create a whole new impression of the interior space. The feel for the room of the ship will be scaled down: I am taking away space from the ship. The large open and lighty original quarter berth is indeed a big contributor to the roomy feeling the King´s Cruisers interior can create. By adding a bulkhead, this will be shut down completely. Shall I go ahead and do it? On the other hand, adding the new bulkhead solves all of the major problems I am facing right now: Where to put the fridge, the life raft, spare sails without bothering living conditions and destroying a clean and neat appearance of the ship. It will sufficiently improve working conditions at the chart table as well. So, what to do? Before coming to a definite conclusion I decide to further investigate into alternative positions for the three big things (fridge, sails and life raft) before the final decision. I hope to be able to come up with an idea what to do now in the next few weeks. It remains exciting. What would you do? 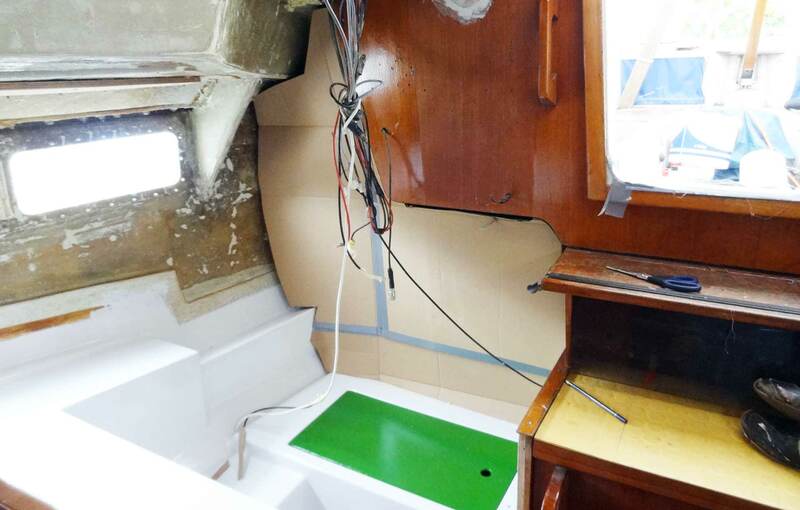 Opt for the rather extreme change of the ship´s interior by adding the bulkhead or preserve the original condition and try to find a different approach? Looking forward to your thoughts and hints. Firstly, if you are going to put the fridge in there, you are definitely going to need some sort of fridge slide so you can easily get it in and out. You mainly see them on 4WD’s. They look like this: http://forum.ih8mud.com/attachments/imag0132-medium-jpg.714856/ . Are you sure that you will have enough space between the chart table to slide out the fridge? Also, how will you get to the life raft if it is behind the fridge? It is always possible to get this thing called a drop down fridge slide: http://static2.shop033.com/resources/09/156937/picture/51/85811025.png . Perhaps it is possible to store the fridge up the top and life raft down below? Secondly, it did occur to me that perhaps you can just put the whole decision off for a season? Paint the inside of the quarter berth, then buy a curtain to cover it up. You can stow your things in the quarter berth and sail for a season and see how you like it. After you have spent more time sailing on your boat with your family you will have a better idea how you will use it and what kind of access you need for things like sails, etc. If after a season of sailing you decide you want to build a bulkhead, it will be easy to fit over winter. Having a curtain there will mean you don’t need to look at a big pile of stuff while you are sailing, but it’s cheap and easy to remove once you make the final decision. It sounds like your refit project is already quite big! Why not put this particular job off until you have more information? again thanks for your contribution. concerning the slides: i won´t need them. the fridge´s size fits just nicely and the new bulkhead will leave enough room for the top-hatch of the the fridge to open up. so that´s nothing to care about. the ideo of postponing the wofks to next year is clever too – unless i don´t want to postpone any works. i want to finish all (if that is possible anyway) this season. but you are right: it´s a tough decision. i am right now exploring another possibility: sawinga big enough inlet for the fridge to fit with the galley and not having to install a new bulkhead. this won´t solve the problem of storing sails and raft, but it won´t change the character of my boat all too much. I think working with a large hard container in an area rolling around in a stormy sea is not a good idea. If you take the container from the. deck you better buy a life rafft in a soft bag which is designed for that purpose. We had years a raft like that in our quarter berth stowed. that´s what i was thinking about, of course in a soft bag. We have just bought a Cruiser and are investigating opening up the area behind the kitchen. As we do not have the boat yet we are not sure what is behind the kitchen (fuel tank). Talking without physically being able to measure/prod – we would consider placing the kitchen on the starboard side and the chart table on the port side. This would mean that the chart table would be accessed either by pivoting chair or from the port settee. I have seen this kind of setup in Van der Stadt yachts work well. This would open up the area behind the kitchen for storage perhaps even a wet berth if required. I am probably way off track but this is our consideration/idea/confusion. Just to add I would like two quarter berths in our family yacht.